If you have been reading along here at My Color Coded Life, you know we bought a home this past April. And when we bought it we knew we had a lot of work to do on it! As I type this early on Saturday morning, I can hear the contractor stripping walls in the basement! My first reveal post was our Dining Room. Now I am ready to reveal Olivia’s bedroom. 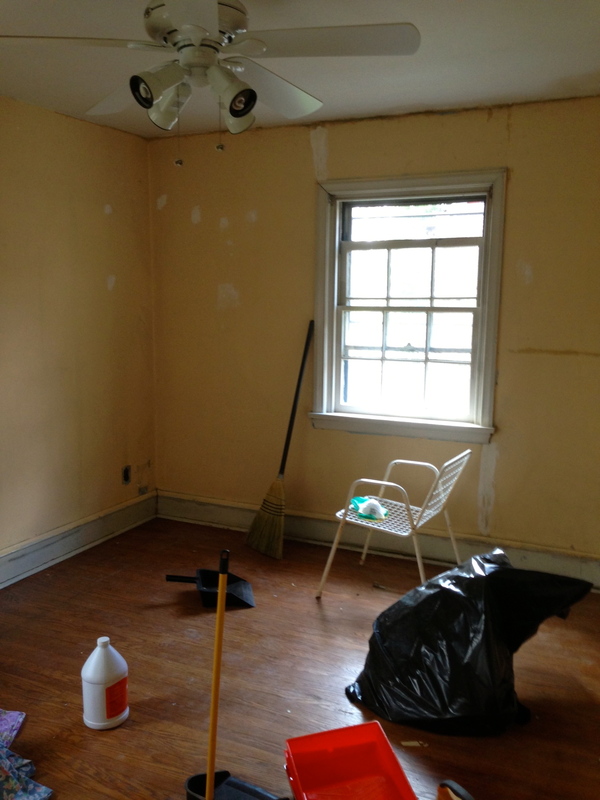 Here we are mid-project – wall paper down! See – beautiful sunlit room, gorgeous hardwood floors – I saw the potential! Ok – are you ready? here we go….. The blue furniture, bookcase, bureau, and wagon all came from my childhood bedroom. I need to redo these pieces – notice the missing knob on the bureau -but for now they work! Antique trunk also came from my childhood bedroom. It’s a great toy box. 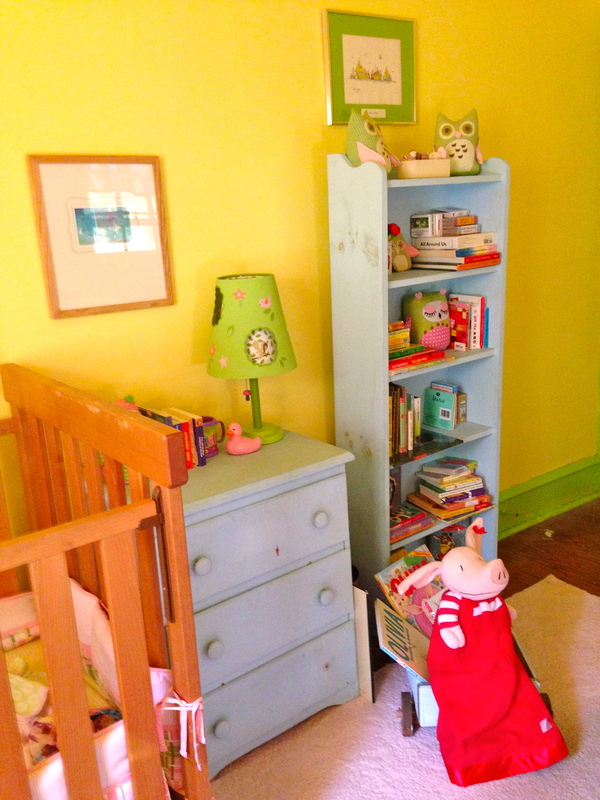 We used Behr paints – Bicycle Yellow for the walls and Hidden Meadow for the baseboards, window trim, and doors. 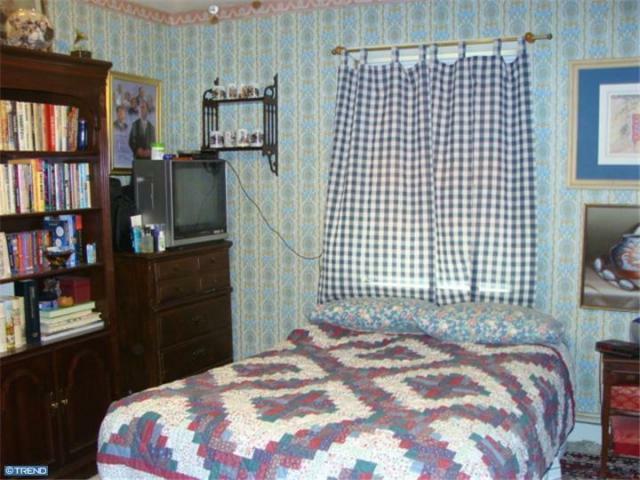 Other colors used throughout the room are pink and blue. For color schemes we are looking at in other rooms click on Organizing Home Decor Projects. 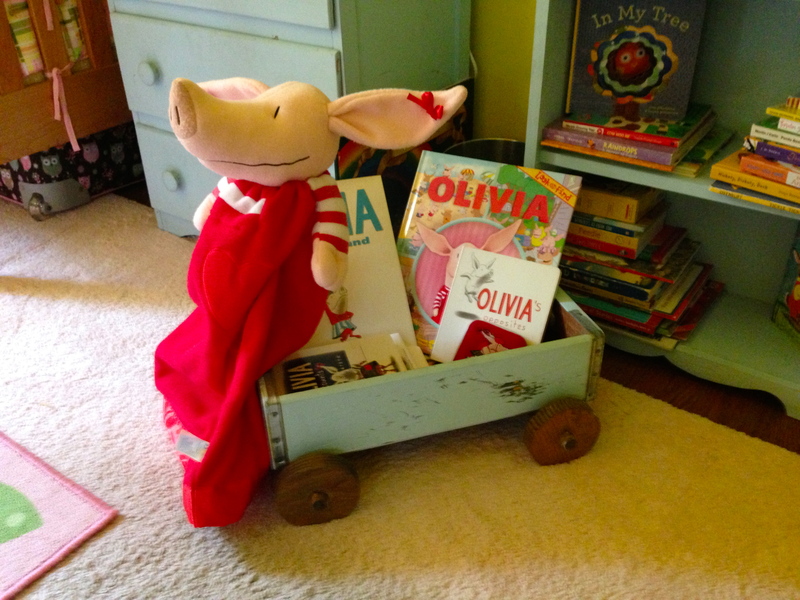 An OLIVIA wagon. I remember this wagon was originally yellow with a Dad’s Root Beer logo on it before my mom painted it blue. I want to strip it and see what it looks like underneath. Any furniture re-doer bloggers out there have some tips for me? This open shelving unit from William-Sonoma used to be in my kitchen in our old apartment. Now it holds all of Olivia’s bins. 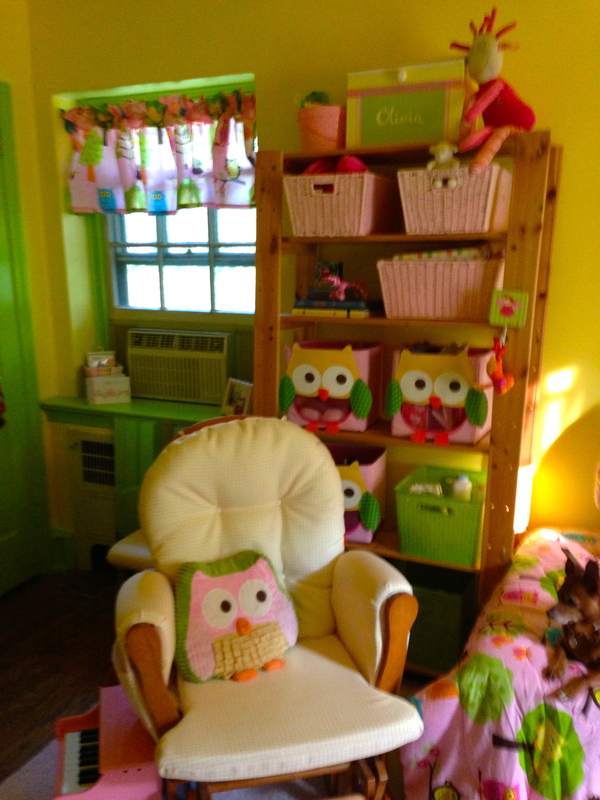 Owl bins and green plastic bins are from Target, pink basket bins are from Baby’s R Us. 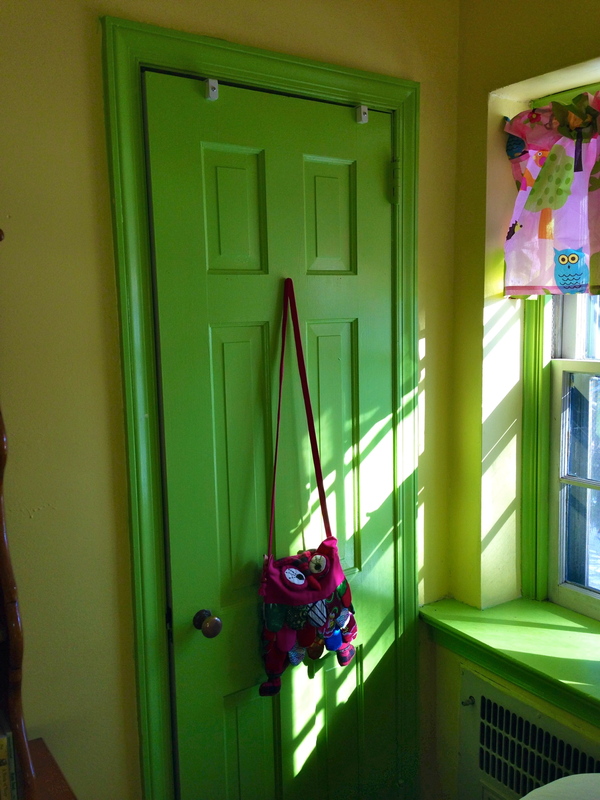 Green closet door with sunlight shining in from the second window. Owl purse from the Great Wall of China brought back to the States from Olivia’s cousin Lilly. Thanks Lilly! 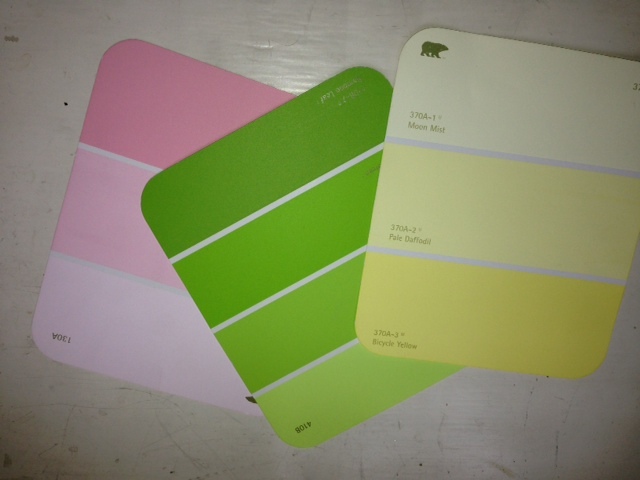 I found this over the door hook at Burlington Coat Factory – can you believe the perfect match it was to the Meadow Green shade of paint? No I did not paint it! 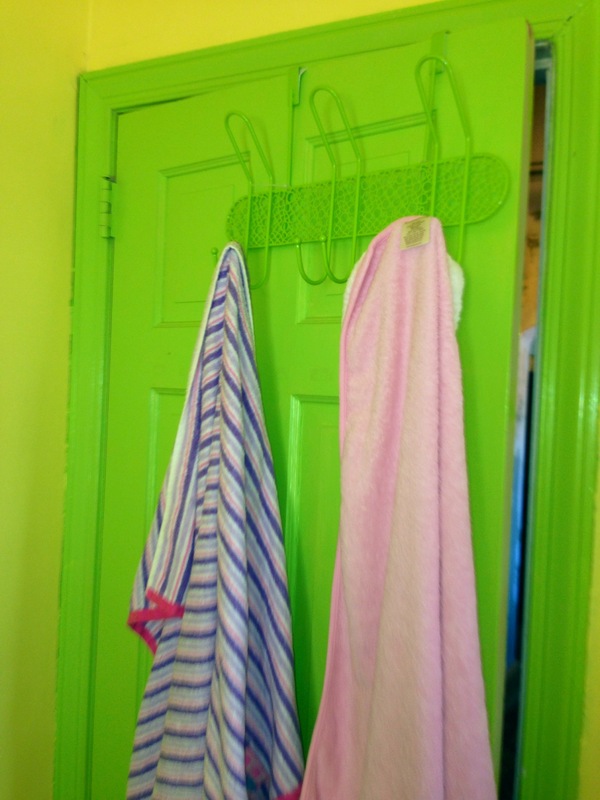 Perfect place to hang towels, out of sight behind the door. As always, this is still a work in progress. But an improvement – don’t you think? 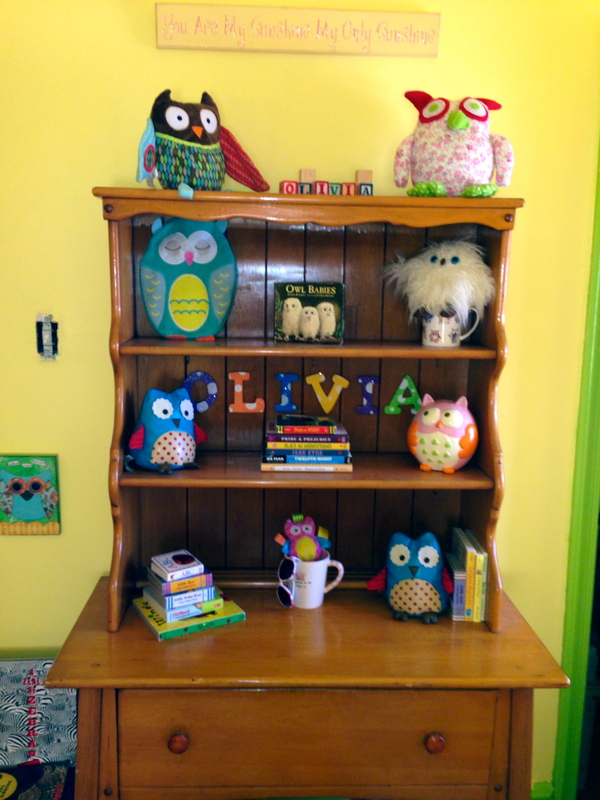 Olivia loves to hang out, play, and read in her room. Things we still need to do – find light switch covers, redo blue furniture, get rid of the rocking chair glider and ottoman (I’m still having a hard time parting with it! ), replace light fixture, and apply crown molding around the ceiling. Still plenty to do! So, what do you think? Leave me a comment and let me know. As always, thanks for reading! Thanks Maria! Open shelving for books sounds great. and love the idea of using hanging plant pieces for all the extra toys and dolls that accumulate!!! 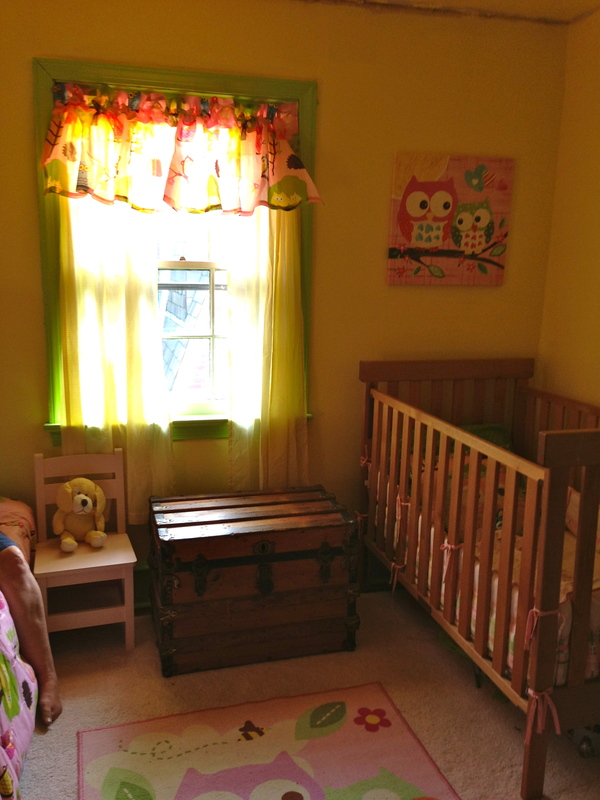 I love bright colors too — I hope these can grow with her and we can just change accents and furniture … but actually – I will probably look forward to redoing it when she gets older! 🙂 Day 1 of basement construction was today …. can’t believe all that was accomplished in just 8 hours…. maybe I’ll instagram a pic. Hope your holidays were great! Hi to Joe and the girls. Thank you Antonio for your kind comment, for posting to your blog, and most importantly YOUR SERVICE TO OUR COUNTRY. Happy New Year! Thanks Holly!! Love seeing pics of X on facebook – can’t believe how grown he is!! Such a gorgeous room! Well done, Maureen!